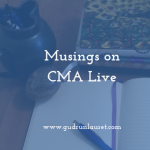 This year’s CMA Live experience was very different to last year, and I think that was really down to how I feel about myself and my business. In the intervening 12 months, I’ve done a lot of work on my message, my offering and my website (although not my social media – one thing at a time!) I felt much more comfortable when talking to people, as well as relating the presentations to my own work. I got my ticket VERY last minute, but although I’d missed out on months of build-up, I was still pretty excited – especially once I’d seen the speaker list. There was no big gang from home going, so I decided to make an effort to speak to as many as people as possible (although I still feel like there were some I’d liked to have talked to more). 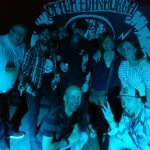 We were back at The Hub again, a convenient stagger from where I was staying on the Grassmarket and a killer walk from the train station (NB – do NOT go up the News Steps with a suitcase). There was a pre-registration social the night before, which I thought was a good way to catch up with the friends I’d made last year and to get a head start on my mission to meet new people. I’ve decided to put my key takeaways in two summary lists, one for each day. If you were there, I’d love to know what the highlights were for you. 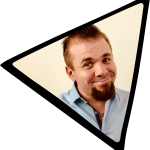 Brian Fanzo: “Disruption and change is the new normal”. Brian’s opening keynote looked at the different demographics that exist in the buying world today, and what (and who) is coming next. Generations Y and Z (the digital natives), are comfortable with change, community and communication, which is why it’s important to be using technology in a way that resonates with them, and to understand that they value experiences more than a product or service. Brian really bought home the fact that current business owners can’t be complacent if they want to remain relevant (and solvent) in the future. As he said, just because your company has been around forever doesn’t make you relatable. 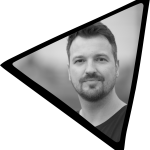 Mark Asquith: I loved Mark’s presentation, because he was honest and realistic about what it’s like trying to win new work and how to operate in the world of business. Mark also talked about what professionalism looks like in the 21st century, and why there’s now no boundary between personal and professional. People are afraid to be their authentic selves, but you have to show your personality in everything you do so others can get to know and trust you. 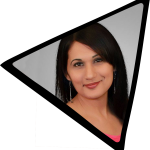 Salma Jafri: Salma was presenting about video strategy. She unfortunately couldn’t get to Edinburgh, so live streamed her talk from Pakistan – very much practising what she preaches! I don’t do video at all, which I think is down to uncertainty around what to talk about. It’s not really a confidence thing, as on the rare occasions I appear on camera I’m apt to rabbit on quite happily! Redefine your key content – what’s the thing you focus on? Ann Handley: I was VERY excited to see Ann Handley. I’d heard lots of good things about her, and I don’t often get to hear professional writers speak. Ann is a huge fan of the book Charlotte’s Web, so much so that she nearly bought the house of its author, EB White. The photo of his writing cabin made me quite envious, so maybe that’s an ambition for me to work towards? Ann described Charlotte persuading the farmer not to kill Wilbur the pig as content marketing. Charlotte is humble and, because she knows it’s about her audience and the product, she takes herself out of the story. “Be a writer first and a marker second and consider what your audience needs”. Ann expanded on this by explaining the 3C Principle and that writing isn’t just about marketing. 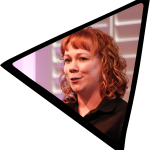 She gave some valuable advice on how to improve on your communications, as well as giving suggestions for tools to help come up with ideas for content that will help your customers. 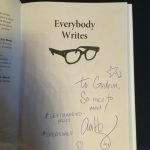 I was lucky enough to grab the last copy of Ann’s book, Everybody Writes, which she signed for me. I chatted to her at the bar at the end of the conference too, and she was lovely. She was also pretty impressed with my unusual name, although I can’t take credit for it! There was an organised social for the first night, a meal at the Ghillie Du. The long, bench-style tables meant that I could strike up conversations with the people around me, and later on everyone moved around. There was definitely some dancing (badly, from me!) going on at the end of the evening, but I was pleased to be sensible and head off to bed at a reasonable time – I’ve learned the hard way that being tired when you’ve got a full day of listening ahead of you is not good! However, I have some experience of them and I do know that the value in terms of learning, networking and support within the groups is huge. As Chris said, one of the benefits is: “You can learn and achieve a lot more when you’re surrounded by other people you can learn from.” Those people don’t have to be ‘experts’ to be able to help you. 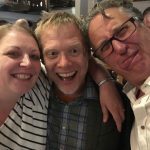 A gratuitous photo of me, Jon and Rod! Jon Burkhart: Jon’s presentation was lively and fast-paced, exactly what we needed for the final afternoon and setting the scene for his frankly bonkers ‘beernote’ at the very end of the day. He talked about the importance of finding ‘firecracker’ questions and looking for ways to make your content different. Ask yourself how you can add provocation or originality into what you produce, or to be playful and surprising. Another theme of the event was not doing the norm or what’s ‘safe’, and Jon encouraged us to try something new. 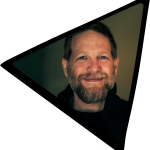 Chris Brogan: “People don’t need content for most of the day. They don’t wake up wanting to consume content … they’ve got things to do.” But there is a point when they do need your content! Chris talked about ‘edge marketing’, which is about being where your customers are, and going where they’re going. Everybody is in their own world, and they only want what we have to offer when they’ve expressed a need for it. 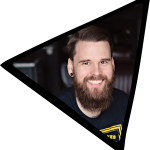 He gave some practical advice about the differences between good and bad marketing and why we don’t need to create more content, just make it right for our audiences. 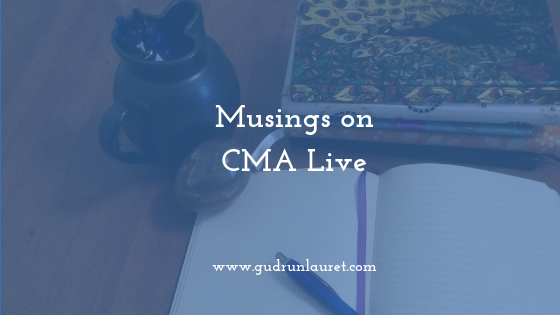 I thoroughly enjoyed CMA Live18, and it seemed to go much faster than last year. 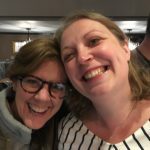 Jon Burkhart’s roundup of the event, featuring backflips from the stage and a beer for every attendee, summed up the unconventional, uncompromising vibe of the two and a half days (I’m including the night before things started). The quality of the speakers was fantastic, and I liked the fact that they all stuck around for the whole event and were friendly and approachable, even late on at the bar. It’s great to network with such a diverse group, as not everyone there was a marketer. It’s inspiring to be in a room full of people who want to learn and push themselves harder to succeed in business. I enjoyed the socials too, even if we did end up in Opium (the rock club) again! I also got to ‘enjoy’ a Buckybomb, which is Buckfast and Red Bull. More importantly, I got to spend time with some of the nicest people I’ve ever met, and I did a lot of laughing, which can only be a good thing. I’ve already secured an early bird ticket for next year’s CMA Live 19, and I can’t wait to do it all again. You can read my post on last year’s event here and find out more about CMA Live here.